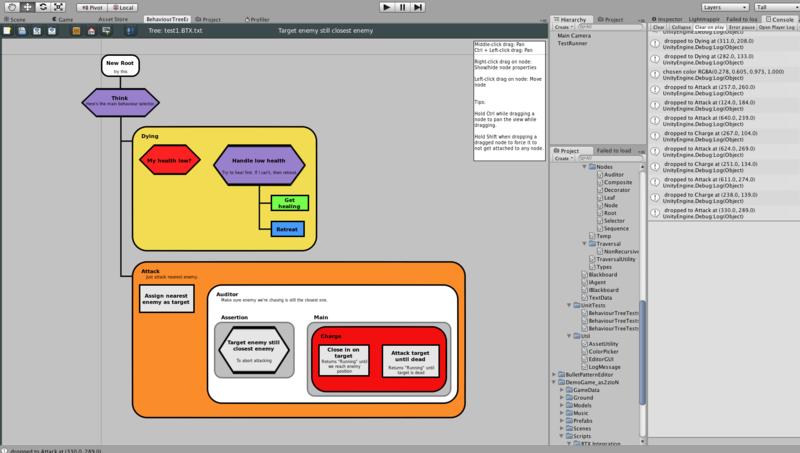 Behaviour Tree Plugin Update: Spiffy New Look! 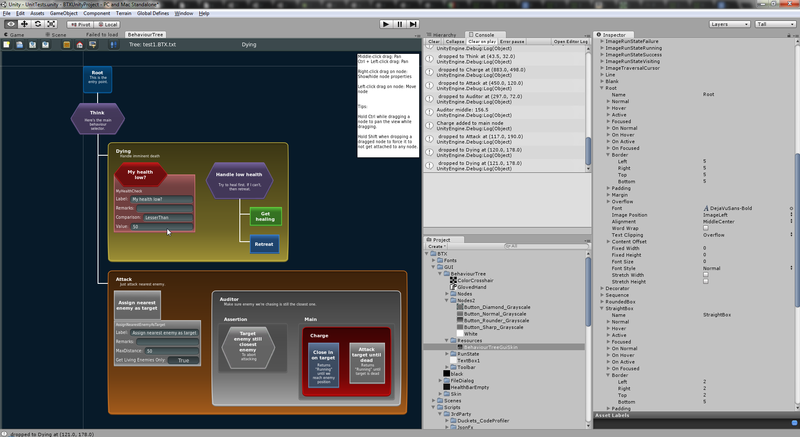 Here’s my answer for not having true concurrent/parallel nodes for my behaviour tree plugin for Unity: Auditor nodes. Actually Alex Champandard already explained before, if for some reason you can’t implement true multi-threaded traversals you can fake it by using the same concept that operating systems do: job schedulers. Which I still didn’t do. At least for now. Auditor nodes merely make sure their assertion branch gets evaluated when you resume from a previously suspended (a.k.a. “Running”) state of the tree traversal. It didn’t justify peppering a subtree with back-and-forth checking of assert nodes and normal traversal (as how a job scheduler might do), because traversal is fast, or at least, meant to be fast. Actions never process their behaviour immediately upon being traversed. They merely request other parts of the game code to initiate an activity for them (please start moving to this location, please attack this enemy, etc.) and such Actions that rely on something to finish first before sending Success or Fail would suspend the traversal (a.k.a. “Running” state). Which is why the Auditor’s asserts are checked only when resuming from a traversal suspend. For cases where the Action/Condition is doing something computationally heavy, it should spread that computation over several frames (a bit like coroutines), hence another use of the “Running” state. The only reason why I can’t make real multi-threaded traversals is because Unity doesn’t play well with multi-threading. For example, checking line-of-sight, as in raycasting, cannot be done in new threads, it has to be done in the main thread, even though raycasts are a very read-only affair. Of the 100 nobles watching, 100 were impressed. Ah… Smell that? 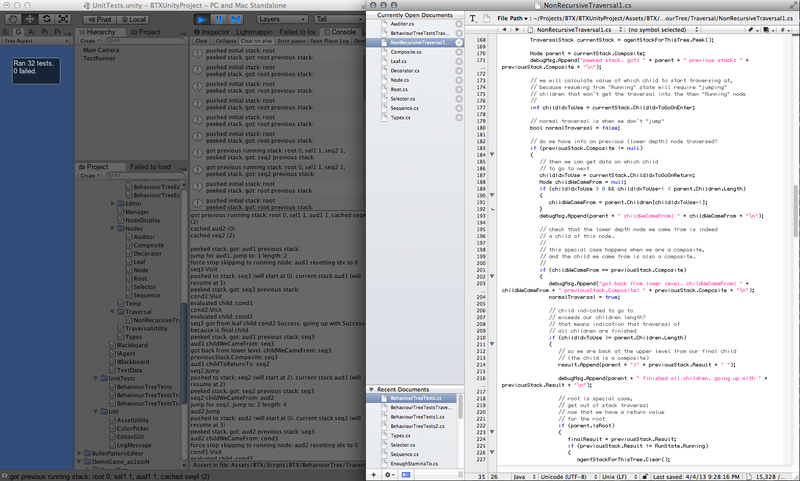 That is the smell of 0 unit tests failing on my non-recursive, brute-forced traversal of behaviour trees. 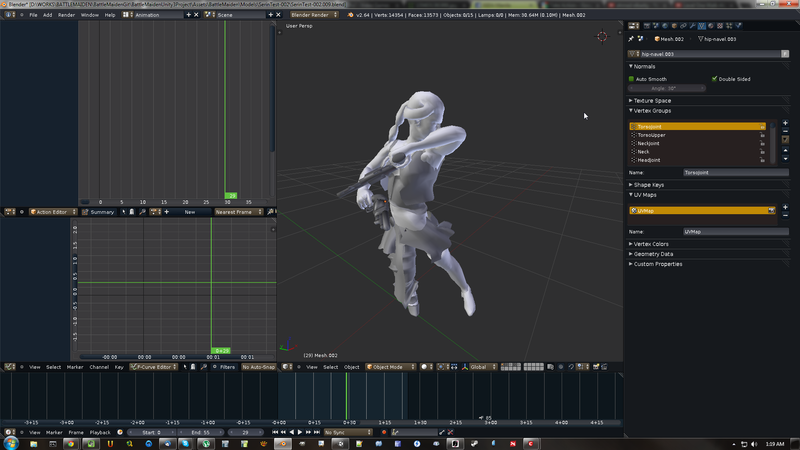 Thanks to Bjoern Knafla for the tutorials! This is part of an effort to improve my behaviour tree plugin. Hopefully I can make a demo game out of it and sell it on the Unity Asset Store. I lately haven’t been able to make any considerable progress with Tactics Ensemble as day job work is taking up a lot of my attention. I’m still working on it though. WordPress.com also has a little statistics report for the blog. Weekly Updates 23 and 24 were spent on a spin-off idea for Victis. In the small game development studio I work on, I lobbied for what we call “Free Friday” where, in every first Friday of every month, for the whole of that Friday, we’re allowed to make whatever videogame concoctions we can think of. This is our excuse to make time doing those crazy ideas we get from time to time. This is also to de-stress (as I like to call it “detoxifying”) from being full of client work. That is, work where we create a videogame for a client, per her/his instructions, leaving little room for creative ideas. The catch with this Free Friday, is we have to start with a blank slate every time, and make sure we have something presentable at the end of the day. Think of it as a short informal game jam. That’s pretty much the basic gist of it. I wasn’t able to have much by the end of the Free Friday so I took the weekend and the weekend after that continuing on it. 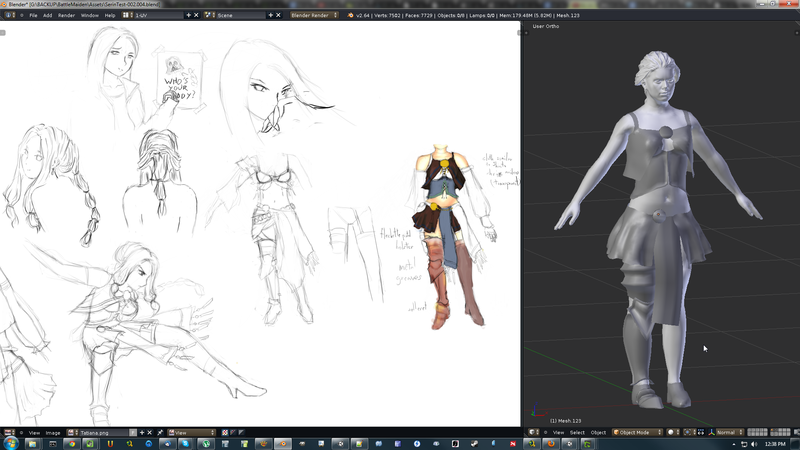 The player character in that little experiment is a Battle Maiden. I wanted Victis to draw (loosely) on Überwald-esque dark fantasy, and that included gypsies. Through some athletic feats of cognition, my train of thought arrived at pistol-weilding, dancing, acrobatic gypsies, that right now I’m calling “Battle Maidens” until I figure out a better name. The idea of acrobatic, one-man army, free-flowing gameplay that Assassin’s Creed and Batman: Arkham Asylum had, fit well with Battle Maidens, so that’s the graphics I used for this Free Friday game.